Mathias grew up on the family farm in the north of Sweden. He has always loved the atmosphere of the kitchen, helping his mother and grandmother to do simple chores. This was how he learned the taste that bread and butter should have, a lesson he has never forgotten. He studied at the hotel school in Umeå before working in well-known restaurants in his country. He then left to work in Spain, an event that sparked his love for its people and food. In 1996, he opened up his own establishment, the “Bon Lloc” (“Good Place” in Catalan). There, he served Latin European cuisine drawing inspiration from Spain, France and Italy. While opening Bon Lloc, he spent 600 hours training for the Bocuse d’Or, which was enough to make him the winner. He believes that talent consists in 10% gift, 90% ambition and 0% luck! 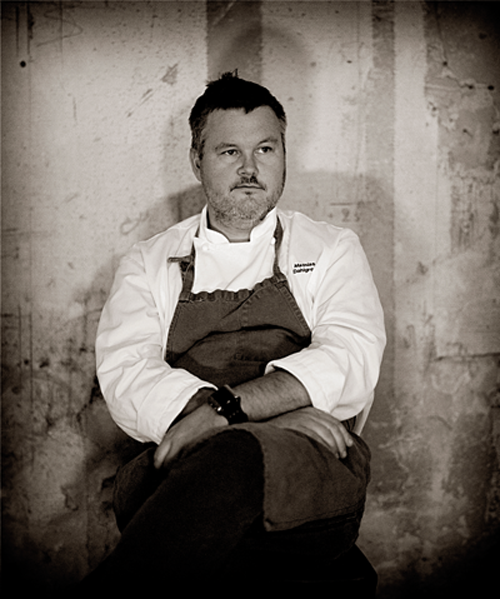 Mathias has been awarded the “Chef of Chefs” title eight times. In 1998, the Michelin Guide awarded a star to his restaurant while the Swedish Culinary Academy gave him its Gold Medal. In 1999, he published his first book, named the best cookery book of the year, and has since been awarded a succession of Best Restaurant titles by Gourmet Magazine, appeared in TV programmes, written articles, given lectures, and so forth. After Bon Lloc, he opened two new restaurants in his name at the renowned Grand Hotel of Stockholm, where he was soon attracting the top critics and was awarded two Michelin Guide stars for the gastronomic restaurant Matsalen and one for the bistro. He features among the 50 best restaurants listed by Restaurant Magazine. Mathias, who has also taught the subject of culinary creativity at university, is one of the leading lights in the new Nordic cuisine that is attracting so much interest.